Amazon.com description: Product Description: In essays like "How to Fake Faking," and the title essay, "The Other Left Side: the Phenomenon of Left and Right in Evolution," Tijs Goldschmidt shatters our expectations of what a scientific essay is and then rebuilds it in intensely personal, artful and wry ways. 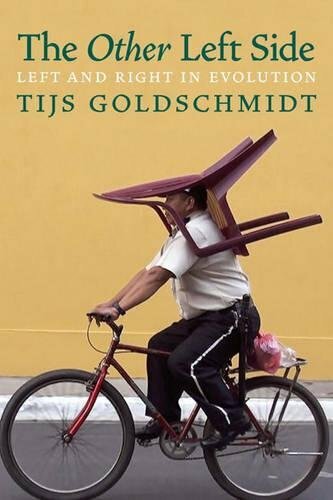 Goldschmidt has won the top awards in Holland and is well known internationally within the field of science writing. Now for the first time available in English, his essays crackle with insight and joy at the discoveries to be made in the world in which we liveÃ¢ÂÂwhether comparing the courtship rituals of men on the dance floor to the springtime courtship rituals of Eurasian wading birds, or visiting Hitler's watercolors in the vault of the US Army Center of Military History in Washington, DC, or noting how clumsy swifts are when brooding on land, or writing fascinatingly about left- and right-handedness.